While the following post is shorter than former ones within this series of posts from a spiritual reading, it is potent in instructing Midori, the client with me, to take personal responsibility for her life. While spirit can act and aid, they cannot create all of the conditions; we must do our part. The science of blessing one’s self has to do with unity of thought, mind, body, and spirit. When this happens, self-mastery is achieved and blessings flow continuously to that person. While I used a translator for the readings, I only indicate the translator when she is speaking on her own behalf. Otherwise, I use Midori’s words as spoken through the translator with Midori’s name alone. Midori: I am planning to go to Egypt in December, but I am only ninety percent decided at this point. If I hear something very good from you, I am going to reach one hundred percent. There is a place called Jabal an Nur and if I pray to awaken and become one with God while I am there, will something good happen? What is my relationship with Egypt? Saint Germain: Yes. It is meant to be that you go to Egypt. As I am in your energy at this moment, there is a fragrance that is Egypt. I don’t know how to explain that to you other than to say that a particular word, such as Egypt, draws in many icons or symbols, including this fragrance. Sunny came to you today because of this question, because you are being guided in the next step of your life to go to Egypt. It is true that the collection or gathering of certain energies in a certain place on earth can be very empowering, and in the energy field of where you want to go, there can be significant help. But I, Saint Germain, am not into magical thinking. Be a master and take yourself there. Be a master and go there because deep inside, as a master, you know you’re supposed to go. Go there as a master, determined to get what you want, and make every effort to get all you can from the experience. Do not hold onto the story that this or that should happen, but go there and accept the full reality of all that actually happens. It is all God; it is all God. If you know that, then something special can happen. It is we who make things happen when we make up our minds to find mind-body unity and do what we feel we should do. The science of spirit descending is that it happens when the mind, heart, and body are united to oneness. For example, the body of the man before you is here with you. He loves you, and he loves his work, so his spirit, reasoning, and feeling are entirely focused upon you. Because his body, mind, and spirit are focused in this way, the miracle of channeling can take place. Through faith and effort, he brought himself into this state, so on this foundation, I am able to enter in. When we find such sensitivity combined with such unity within a person, we can work greatly with that individual. Be a master and bring your thought, mind, body, and spirit all together, but do not be attached to the outcome. Leave that in God’s hands, and learn from the entire experience. You are intended to go there, absolutely. Absolutely. Sunny is going with you and has already made plans for you there. 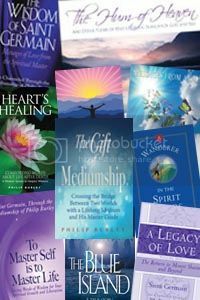 Leave a reply on "A Spiritual Reading: Part Four: Be A Spiritual Master"